But in 29 years of combined school grades and teachers, I’ve never been asked to be the Room Mom. The teacher who proposed such an obvious travesty of scholastic volunteerism is new, so I quickly said yes before she Google search me. (Rookie mistake.) Since I’m new to the Room Mom game, I had some questions of my own. Like, is there a union per diem minimum? (No, in fact you’ll be expected to pay out-of-pocket for countless expenses.) Will my yearbook profile include high res photos or standard? (We don’t exactly feature parents in the yearbook.) When driving to field trips, do I collect gas money from the kids before or after I drop them off? (Wait, what?) Are there any allergies I should notify the caterer of for the class parties? (We don’t use a caterer, maybe we should talk…) My first arts and crafts project is wallpapering my bathroom so I’m going to need 4,288 glue sticks added to their required supply list. (On second thought, we may not need a Room Mom this year.) Your Tuesday Reading Circle is on my preferred spa day, so can I move in a massage table on those carpet squares? (@#$%^&*) Why is your face so red? Who are you calling? Are handcuffs really necessary? 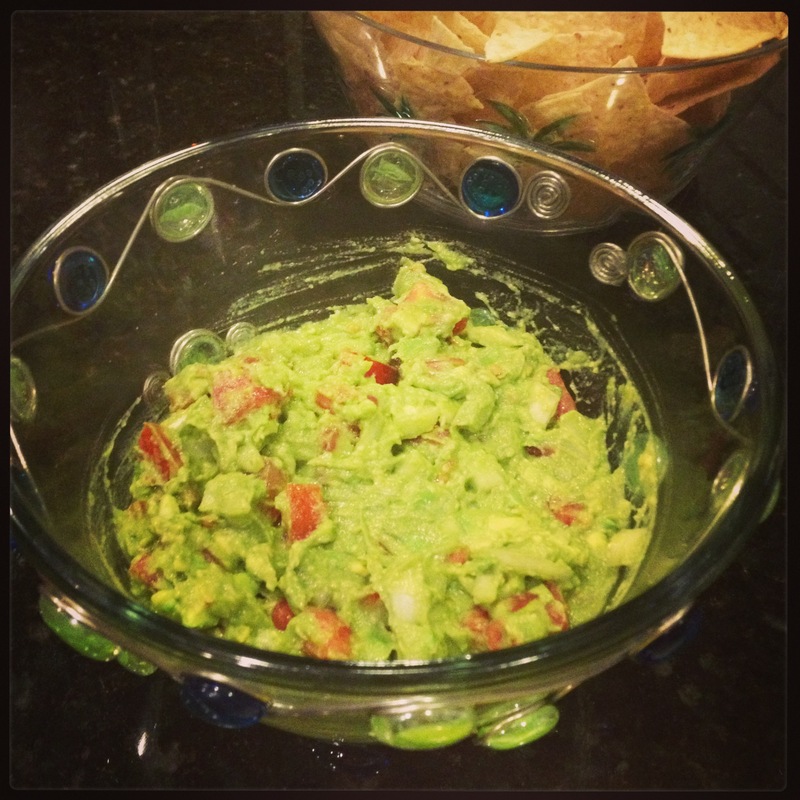 One of the recipes I get asked about the most–Guacamole. Mash the avocados with the back of a fork in a medium bowl. Mix the 3–exactly 3–ingredients together. Resist the temptation to make it more complicated than it is–you will thank me later. Season with salt and pepper and enjoy by the handful or use tortilla chips. Note: The only variation I will allow is the addition of fresh cilantro if you love fresh cilantro, or a squeeze of a fresh lime. Ripe avocados are a must. Buy the nice blackish-skinned ones, but if they aren’t quite ripe yet place in a brown paper bag for a day or so and they’ll ripen quickly and guac-ly. One of the very best happy accidents of this new venture has been how much more crowded my kitchen has become. As soon as I mentioned the new blog to my friends, they have jumped right in offering recipes, taste-testing, opinions, and wine-glass filling. The test kitchen has become my favorite place with some of my favorite people along side offering their generous and delicious additions. 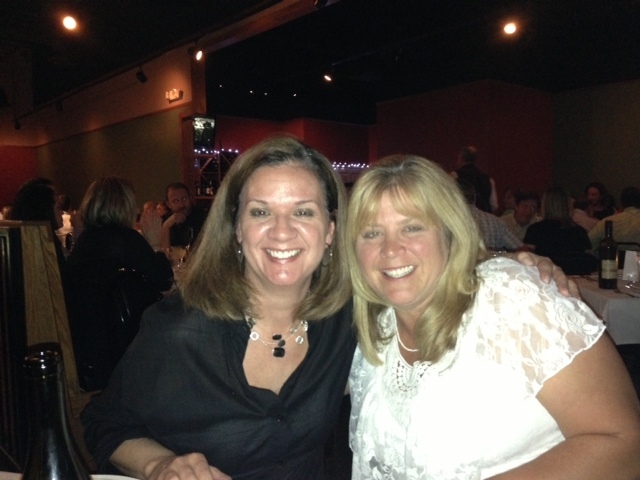 Such was the case when my friend Mikki came through town this summer. 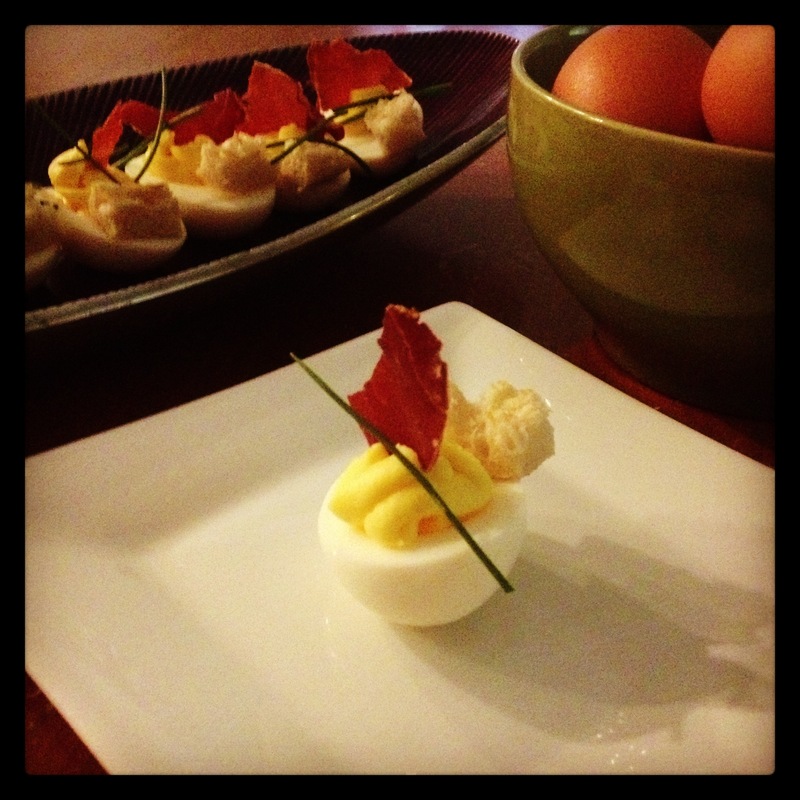 After a bottle of wine or seven, we came up with the most decadent deviled eggs you’ll ever meet. These are so good and so rich, you’ll move up a tax bracket after just one bite. 1.) Cut whole eggs in half lengthwise and place on a large platter. Put yolks into food processor. Pulse until smooth. 2.) Add vinegar and lemon juice; pulse again until smooth. With processor running, add the meted butter through the feed tube and blend until smooth and creamy. Use spatula to scrape sides, add salt to taste, blend again. This should resemble and taste like hollandaise sauce. 3.) Place yolk mixture into a plastic bag with the tip cut off for piping. Pipe into eggs. If mixture is slightly runny or soft, it is ok, it will set up nicely in the refrigerator. 5.) Toast English muffins and lightly butter if desired. (It really doesn’t need it.) Cut muffin into small, crouton-sized chunks. 6.) Assemble eggs by placing a piece of the crisp prosciutto, muffin crouton and a sliver of chive on each one. 7.) Makes 36, defibrillator paddles optional. As I sit here on the eve of the first day of school, which has crept earlier and earlier each August until it seems as though the 4th of July is closer than Labor Day, it occurs to me that the local School Boards may be suffering from an embarrassing affliction. I know it’s not quite PC or appropriate to discuss outside of AM radio talk show commercials and creepy email spam, but I think there’s a rampant case of premature education going on around here. It only takes a simple Google clip art image search of the words, “Back to School” with its apple-laden, fall-leaf-wreathed chalkboards and discounted plaid wool skirts with turtlenecks turned up to earlobes covered by fur-lined ski caps to confirm that the web–which is World Wide I remind you–universally accepts the fact that the First Day of School is an autumnal event. And though I am not Julius Caesar, I maintain that August, and certainly July, land squarely in the Northern Hemisphere’s summer, and therefore, by its very position in the space-time continuum, charted latitudes and longitudes, maritime tides, and proximity to the solstices and several Independence Days, both foreign and domestic; are historically, meteorologically, ill-timed months to resume scholastic endeavors. In other words, you may be pulling the trigger a little too early, Board of Education. August 7th was our start date this year. This is actually a week later than most of the schools around us, so I guess I should feel lucky. The earth has had seven more days in which to retain summer temperatures approaching triple digits. 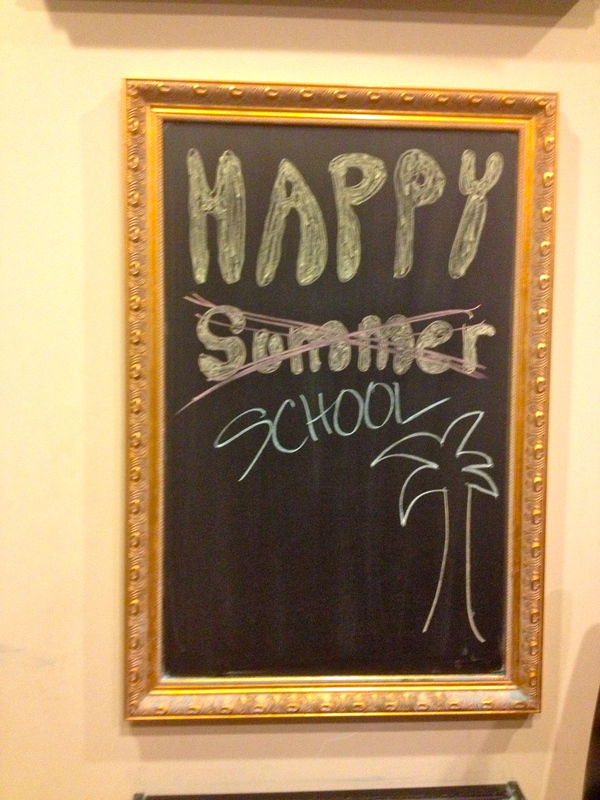 Clearly there is some confusion on the Board with regard to an appropriate First Day of School. As the helpful citizen that I am, I would like to provide this brief tutorial to school planners to consider when they prepare next year’s calendar so they are not, once again, subject to this embarrassing and inconvenient problem. If you start school before your state’s tax-free holiday on school supplies even begins, you may be guilty of premature education. If playground balls fuse to the blacktop in the blistering heat, it may be a sign of premature education. If the first holiday off you have after the first day of school is a Christmas in July mattress sale, it just may be evidence of premature education. If parents are confused on whether the first day is a start date or an end date to the school year, well, it just may be a textbook case of premature education. If you have to pack zinc oxide and salt tablets in your child’s lunchbox, chances are pretty good you’re prematurely educating. If your child’s “school bus” has a freezer on board, plays “Pop goes the Weasel” and serves Push-ups from a side window, premature education could be to blame. If your official school uniform includes flip flops and a panama hat, methinks it clearly is premature education. If students have completed all of the material in their textbooks before they’ve chosen a Halloween costume, premature education should be considered. If your child was born under the zodiacal sign of cancer and has to bring in birthday cupcakes for his classmates, talk to your doctor about premature education. If your child has ever brought a watermelon for a teacher on the first day instead of an apple because that’s the only fruit in season, education prematurely could be the culprit. If there has ever been a wave runner in your school carline, there’s no shame in admitting your premature education. If your child is taught how to convert Fahrenheit to Celsius and Celsius to Kelvin to record the average temperature during science class; well, just sayin’. If your child has ever had to write a paper on Bastille Day due on Bastille Day; ahem. And finally, if as part of their emergency planning your school regularly conducts Sharknado drills; I rest my case. You’re welcome. Now everyone is satisfied. These are simple to make on a weeknight, but can easily be dressed up or down for your family’s tastes. 1.) Set up a breading station of the flour seasoned with salt and pepper, the eggs beaten with a little water, and a plate of the panko. 2.) Heat a non-stick pan with a couple of tablespoons of olive oil over medium-high heat. You may have to re-oil in between batches, so don’t put the bottle away. Preheat the oven to 350°. 3.) Bread each cutlet by first dredging through the seasoned flour, then the egg wash, and finally evenly coating with the panko. Do 3 or 4 cutlets and place them in the pan. Do not overcrowd–do in batches if necessary. 4.) Cook the cutlets about 2-3 minutes per side, just to give a nice brown color. Try to only flip once to preserve the panko crust. When golden brown, remove from pan and place in a single layer on a rimmed cookie sheet in the oven to finish cooking, and while you cook the next batch. 5.) Continue with all the cutlets and bake in the oven another 10 minutes or so until they reach 165° internally and no longer pink. By finishing in the oven, you still get a properly cooked chicken but the crust is still crispy and golden rather than charred. 6.) 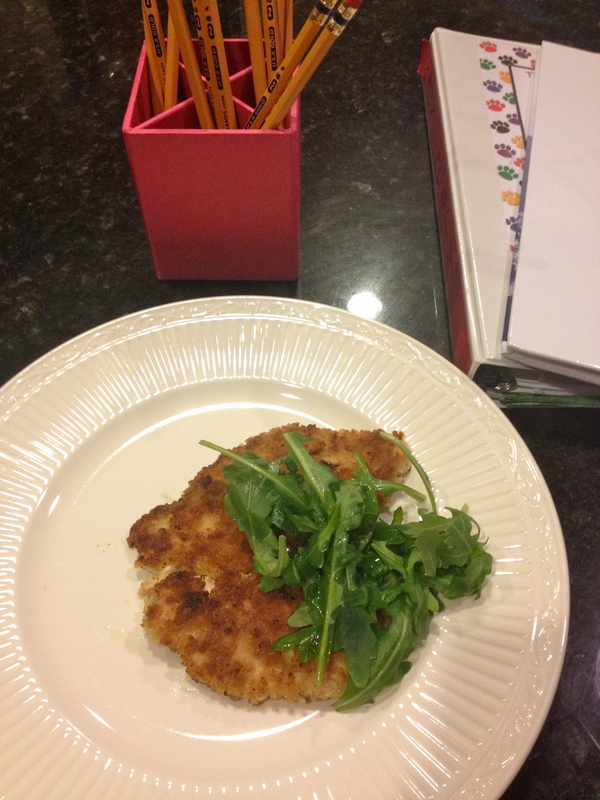 Serve either as is, or top with a handful of arugula tossed with Dijon-lemon vinaigrette–it gives a nice freshness and bite to the simple cutlet. I haven’t bought a bottle of salad dressing since the Clinton administration. Not when it is so much easier, tastier, healthier and less expensive to make them on your own. Here’s a simple one to start with that will transform your salads instantly. All you need is a jar with a lid or some sort of dressing-making vehicle. Mine is from the last Pampered Chef party I went to at the same time I bought that last bottled dressing. 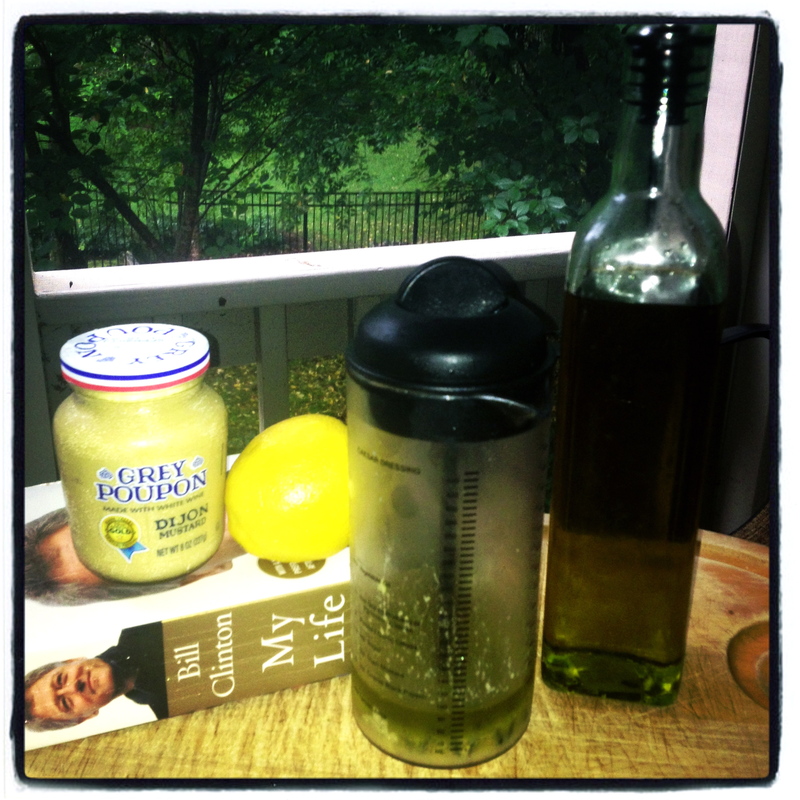 Best Dijon-lemon Vinaigrette. Est. 1998. 1.) Plop a spoonful of mustard in the jar. Juice the lemon over top. Add the olive oil. Season with a generous amount of salt and pepper to taste. 2.) Shake or mix well. 3.) Serve over a salad or with a straw. It’s that good. Allow me to introduce myself, I’m your new neighbor. That neighbor. Oh, I don’t plan any trouble, slights, inadvertent impoliteness, or anything to make you call your insurance company, emergency services or realtor; but chances are pretty good that you will at some point. I apologize in advance and offer these anticipatory peace offering muffins. We have teenagers who park poorly and will probably impede your driveway access at some point. We have young kids that have cannot keep a ball in their own yard to save their life. We have a dog. Cute, but she’s a runner and a digger with a propensity for your fence line and begonias. We have parties. And house guests. And a drum set. And inappropriate boundary issues. But if you’re able to overlook these few flaws–and the tragic paint color experiment on your side of the house–we do have our good points. Like you know the Bunco group with all of the popular people in the neighborhood? Well, I’m blacklisted from that one but I’ll bring you as my personal guest to the one formed by outcasts in dramatic protest. And you know that giant nest of rabbits that live under your back porch? They used to live here before I chased them out after eating the biggest patch of basil this side of Tuscany. I’ll make you (and your exterminator) a batch of homemade pesto. So while it may not seem like we make the best neighbors, we do make pretty decent friends. Join us for a BBQ this weekend and I’ll show you. 1.) Preheat oven to 400 degrees. Sift together cake flour, baking powder, and salt in a medium bowl. Reserve 1 Tablespoon and toss over blueberries in another small bowl. Set both aside. 2.) Whisk together sugar, sour cream, oil, egg and almond extract. Slowly add the dry ingredients and stir until just combined. Gently fold in blueberries. 3.) Line a muffin tin with papers and fill each with the batter evenly. Sprinkle each with a healthy sprinkle of turbinado sugar before putting in the oven. 4.) Bake for 20-25 minutes. Deliver to new neighbor. No mention of highjacked wifi needed. In my old liberal hippie escape fantasies, I used to want to run away to Vermont and start a lavender farm and make my own soap. Now, I want to run away to Tuscany to start a pine nut and basil farm and make my own gelato. 1.) Freeze or refrigerate chocolate chips until ready to use. 2.) Combine milk and cream in heavy saucepan over medium heat. Heat through until it foams around the edges. Whisk in espresso powder and vanilla until dissolved. 3.) Meanwhile, whisk egg yolks and sugar until pale and sugar is dissolved. Add about 1/2 cup of the milk mixture to the eggs–stir well, then add the rest and stir until combined. Return the entire mixture to the saucepan and heat through until it coats the back of the spoon, about 3-5 minutes. 4.) Strain the mixture through a sieve into a clean bowl or pitcher, cover and chill about 3 hours. 5.) Following your ice cream machine instructions, process the gelato for about 10-15 minutes or until just about done. Add the chocolate chips in the final minutes. Freeze until ready to serve. 6.) Search out Italian farmland and used gelato street carts on the Internet. Although we have settled in nicely into our new home, there are still a couple of aspects of Southern life that I have yet to get used to. Oh, I’ve mastered yelling “UNSWEET” quickly after I order my iced tea. I’ve figured out what a Meat and Three is and I’ve even learned that rain makes corn and corn makes whiskey, as well as making Tennessee cars slow to .4 mph. But even after all of these Southern life lessons, my biggest conundrum remains: how anything gets done around here. I’ve said before that someone could make a fortune actually providing services that people want and need down here, and yes, I realize that makes me sound like a Yankee carpetbagger. But then at least YOU’D HAVE SOMEONE INSTALLING CARPETS, SOUTH. Our homeowner troubles began before we even moved in when the landscaper from the previous owner wanted to charge us $5600 for yard work. On the yard that he had been paid to maintain. And then it was the cable company who installed cable in the house, but if I wanted any “non-covered” services like moving the TV or putting batteries in the remote, I could pay them cash on the side. We hired a carpenter to build some shelves and install a wine cooler. After months of excuses, on the day he was supposed to deliver it his wife emailed to say the cooler had died in an unfortunate car accident on the way to our house along with the receipt and dental records. I had a repair man come out to fix our gas grill. Before he even rounded the corner to the back yard, he threw up his hands and declared that “on behalf of myself and Sears, I decline to work on this equipment,” as if he was stating his intentions to a hidden NSA agent. He said I didn’t have a “grill,” I had a “De-luxe Bar-B-Cue System,” that required a specialty repair service from a fire and hearth store, despite having bought the stupid thing at Sears the year before. We’ve had three different trash companies because they just stop picking up, you know, trash? When we decided to get an outdoor fireplace built like many of our neighbors, I started calling the numbers from some of the home magazine advertisements. Only one actually came out and then wouldn’t show us a rendering until we paid a deposit so we wouldn’t use anyone else. I went to a store that had outdoor fireplaces on display at its entrance. I filled out a request form in person for a contractor to contact me. Not only did they never call, but I think they blocked my number and put my picture on the wall warning that I was as dumb as, and therefore not to be sold any boxes of rocks. So when in a last ditch effort for outdoor warmth a postcard addressed to “Resident” which I was beginning to doubt referred to me, arrived with pictures of fire pits and hardscapes I was not only hesitant and skeptical, but perhaps a bit masochistic when I placed the call. I left a message knowing full well it would only end in ignored heartbreak, but much to my shock and awe, he returned the call. And he came out that same day to take measurements and give me a brochure. And then he emailed me that very night with an actual price quote. And then if I heard him right over my screams of joy, he said he could start the work on MONDAY. When the orchestra of angels quieted, I sent a quick note to my Homeowner’s Association letting them know that s’mores were being served at our house next weekend and instead of offering to bring graham crackers, the woman sent back an architectural modification request form and instructions that it would take 45 days for a response. 45 days? South, have you met you? Because I assume that a Homeowners Association are owners of homes associated with my geographic area and therefore know that the number of obstacles, natural disasters, suspicious fires, and shiny things that can derail a home maintenance project in the South are only outnumbered by the amount of cowboy boots and aspiring country singers at Tootsies on a Saturday night. And before you think this is only limited my bad northerner luck, our neighborhood clubhouse holds a support group for grief-ridden residents mourning the loss of their deposits and souls to a driveway sealant company every Tuesday. At the time of this publication, I face a dilemma. Do I listen to the proverbial angel on my shoulder telling me to submit the required paperwork, wait for the inevitable approval a month and half later and based on nothing in my history, experience or common sense hope that the contractor will still be in business, available and/or not incarcerated? Or does the devil’s advice of submitting the paperwork but going ahead with the project before the actual approval comes and risking nasty letters and possible fines from HOA win out? I hear official stationary makes the best kindling on cool Southern nights. 1.) Char the red peppers by placing directly over an open flame such as an illegal outdoor fireplace or your gas stove burner. Hold with tongs to blacken the entire surface then place into a bowl and tightly wrap with plastic. Let sit in wrapped bowl for 30 minutes or until cool enough to handle. 2.) Peel away all of the skin off the peppers, remove core and seeds, and slice into thin strips. Arrange on small platter. 3.) Mix the first 6 vinaigrette ingredients in a small bowl. While whisking, slowly add the olive oil to form a dressing. Season with salt, pepper and sugar to taste. Set aside. 4.) Pour half of the marinade over the peppers, rough chop the olives and mix in the remaining marinade. Layer olives over top peppers and sprinkle on capers. Serve at room temperature. 5.) Serve proudly at the next HOA Disciplinary Hearing. After almost two decades along my journey through motherhood, I finally felt as if I’d grown out of the minivan phase and could log the remaining miles in a vehicle that wasn’t the mom jeans of the automobile industry. It’s not that the van didn’t serve it’s purpose (of aging me 15 years) for a time when the kids were smaller, but it was time to move on and up to a more age-appropriate and respectable car. Despite being born and raised in Detroit, purchasing a new vehicle is not one of my favorite things. I certainly like driving a nice car, but the procurement of said automobile is painful and tedious in my opinion. The negotiating process makes me want punch babies, so I have abandoned this task to my conflict-loving husband many years ago. It’s worked out well until now. On our recent new car purchase, my husband dutifully chose, negotiated and secured our family roadster. My only request was that it wasn’t a minivan, and all doors must open instead of slide sickeningly along a Cheeto-laden track. All that was left for me to do was drive in the old van for the trade-in assessment (which I had judged to be about 46 cents and a tetanus shot) and pick up the new car. I see now it was here when things took their turn down a dark path. Me: So while I’m waiting, can we look at the car since I haven’t seen it yet? Salesperson: We have to special order your car, we don’t have it here. Me: That’s okay, I can look at something similar. Salesperson: We really don’t have anything close to what you ordered on the lot. Me: (Confused.) Um, okay. How about if I just look at a brochure? 15 minutes later Salesperson returns not making eye contact. Salesperson: I’m sorry, we have no brochures and I can’t even show you a depiction online because yours is so different that IT WOULD CONFUSE YOU. At this moment I should have grabbed the keys to my old van, prayed the thimble of gas I left in it would have held me past the dealership driveway and returned immediately to the compound where Moms like me aren’t subjected to confusing things like paint and interior color differences. But I didn’t. I guess I was indeed confused wondering why my husband had purchased a vehicle enrolled in the witness protection program and why my new car was as embarrassed to drive me as I was of my old one and it hadn’t even seen my jeans yet. And while this was annoying, insulting, asinine and unacceptable; IT WASN’T A MINIVAN and therefore worth the humiliation. And ultimately my personal safety, because before I had time to preset my radio to the folk music and NPR stations, I had to make an emergency return to the dealership when I noticed a slight problem with the brakes: I had none. Me: (Shaking)This brand new car has no brakes. I can’t believe I made it here alive. Salesperson: You probably have the emergency brake on–new cars take some getting used to and this one’s got a little more power than your van. Me: The emergency brake is indeed on now because I had to apply it in order not to mow down the customers in your showroom because I HAVE NO BRAKES. Salesperson: (Condescendingly.) I’m sure it’s user error. Why don’t you go into the lounge and have a glass of sweet tea while the mechanics look at it. Salesperson returns 15 minutes later. Looks nervous, avoids eye contact. Salesperson: Well, it looks like there are no brake cylinders in that car of yours. They all have to be replaced. Me: How does that happen? Salesperson: Not real sure–should never have passed inspection. Regardless, it’s unsafe to drive. Salesperson: I’ll tell you what I’m going to do–I’m going to set you up in a rental free of charge while we order new parts. Salesperson: Let me put you into this nice minivan for the time being…. So it turns out I really wasn’t ready to put the minivan in my rearview mirror after all. 1.) Grill flank steak seasoned with garlic salt or salt and pepper on the grill or grill pan on the stove about 6 minutes per side or until medium rare. Set aside to rest at least 15 minutes. Slice steak thinly on an angle against the grain. 2.) Cut French bread in half on an angle and then slice down the middle horizontally so you have two sandwiches. Drizzle the bottom bread slices with olive oil then lay the steak slices all along the bottom. 3.) On top of the steak, layer the peppers, goat cheese, and avocado. Top with arugula, and drizzle with a little olive oil and salt and pepper. Replace top bread slice, and wrap tightly with plastic wrap. 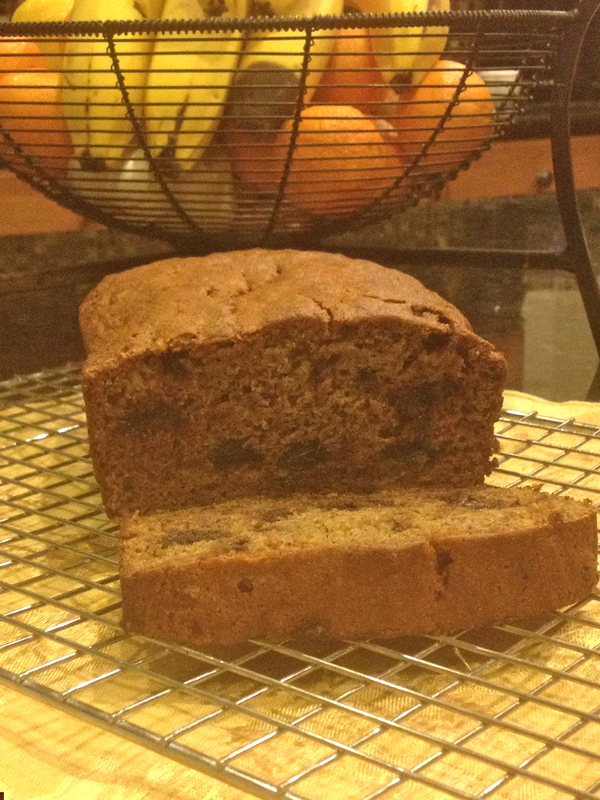 Chill for a couple of hours to let the flavors develop, but not too long so the bread and arugula gets soggy. 4.) Pack in cooler and pass up every fast food joint on the interstate in your new or old car. There’s a certain inevitability on any given radio dial in the Year of Our Lord 2013, that at some point within a 3 minute time period, you will be subjected to a Taylor Swift song. Whether this entertains or tortures you is your business, but for me, it provided an unexpected birthday gift this year. With just a little tweaking to her smash hit “22,” Taylor gets me. So, thanks, T-Swizzle for capturing exactly what it’s like to turn 42. After I spent an insane amount of time rewriting this simple song, I realized that I didn’t even turn 42 this year–I’m effing 43 which is such a 42 year old thing to do that I could have added another refrain. So here’s some damn sugar and chocolate with booze in it. Happy @#$% birthday to me. Beat egg yolks, 1 tablespoon coffee, 1/2 cup sugar until well combined. Add the mascarpone and beat until smooth, about 3-4 minutes. Remove from mixing bowl and give the bowl a wash and final rinse in cold water. Whip egg whites and a pinch of sugar until fairly stiff; gently fold into your mascarpone mixture, just until combined. Don’t over mix. Rinse the mixing bowl out in cold water again, dry, and whip the heavy cream with the remaining scant half cup of sugar. (You can adjust the sugar here to taste, and add a teaspoon of vanilla if desired.) Set aside. Mix the last of the coffee with the Kahlua or brandy in a shallow bowl. Dip a lady finger quickly, and then line the bottom and then the sides of a 13×9 glass dish or trifle bowl with the cookies. Layer half of the mascarpone mixture, sprinkle with cocoa, then repeat with a layer of dipped ladyfingers. After two layers of cookies, cheese and cocoa, top the top with the whipped cream and cocoa. Drizzle with some Kahlua if desired and wrap tightly in plastic wrap. Chill 4-5 hours, but it’s best overnight. Sing “Happy Birthday” (or any Taylor Swift song) loud and proud.